Ashrind the MacBook, subject of last week’s post, has returned to my hands from its likely final visit to an Apple Store with a healthy new battery, a good-as-new keyboard, and — I hope — a few more years of viable use. Before I left it at Providence Place, I took the attached picture of the stickers it has accrued on its lid. 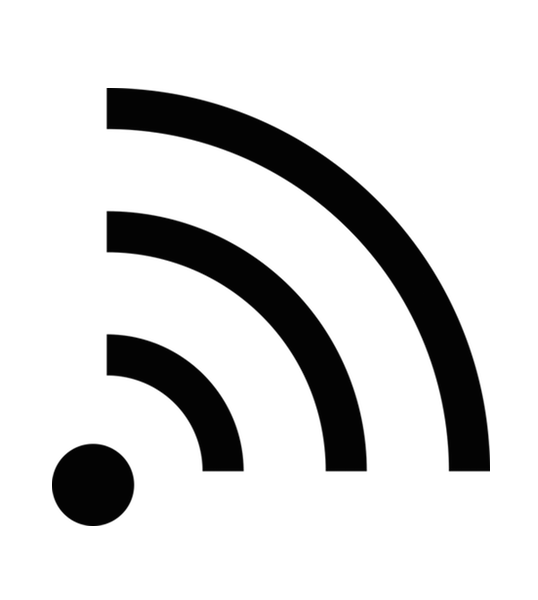 How about I share the stories behind them, in celebration of Ashrind’s continued resistance of digital dotage? Even though this laptop has served as an inseparable companion since 2012, I didn’t start decorating it before early 2016, and the bulk of its glued-on accoutrements date to only the last calendar year. Never really one to sticker up a laptop or a car or the backs of street signs near my house or anything, I didn’t become a laptop-decorator until the role was thrust upon me, as I shall now relate. Duck Duck Go: In early 2016 a community manager at Duck Duck Go noticed that my bespoke blog software makes DDG its default search utility, and mailed me a stack of these stickers in recognition. It took this unexpected act of pleasantly personal corporate outreach to get me to consider pasting any stickers at all to my heretofore unblemished MacBook lid. It seemed more like a badge, though, an emblem with a tiny true story that would make me smile a bit every time I saw it, far more than a typical glue-backed company logo from a conference goodie-bag or whatnot. So I stuck it on. Black Lives Matter: A whole year after receiving the DDG stickers, I purchased and affixed this one as a reaction to Jeff Sessions becoming U.S. attorney general. I wrote a Fogknife article about all this, at the time. Certainly, I feel today about the slogan and the movement to which it refers exactly as I did then. 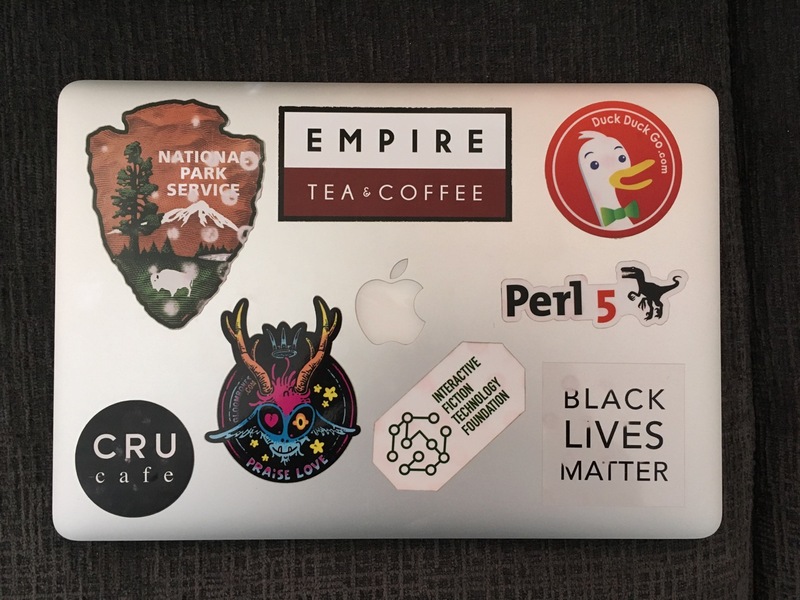 Since this represented the first time I sought out and obtained a sticker with the express intent of laptop decoration, it had the unavoidable side effect of opening the door to all the stickers that would follow. National Park Service: First of all, I should note that this sticker looks just awful after more than a year of rubbing against the ribbly little villi that line my bag’s laptop-sleeve. Vinyl stickers resist these destructive effects of my bag’s protective nubbins, I have learned, while paper stickers are all too happy to give up their ink to any such persistent source of friction. By continuing to display this sticker I realize that I mark my laptop as the gallery of a first-timer stickerer, and really I ought to show a modicum of corrective dignity and just peel this one off. As to why this huge arrowhead claims this corner in the first place: in late January 2017, four days after Trump’s inauguration, the Twitter account of the Badlands National Park posted a bunch of climate change facts. Observers tended to interpret this as a doomed but meteor-bright act of defiance against the incoming anti-scientific administration, which had wasted no time in ordering federal agencies to stop educating the public about global warming. The tweets, of course, vanished within hours, even though their publication had made news headlines around the world. I felt very moved by this bravely futile candle held against the flood of New American Ignorance, and I wondered if the likely self-sacrificing act of this anonymous federal employee would turn the logo of the National Park Sevice into a sign of resistance. I gambled a sizable sticker-spot on it. The Apple Store employee who checked my laptop in last week asked me if I worked for the Park Service, and I said “no”, feeling unmotivated to offer any further detail. So, no, I don’t think it ever really caught on, not even with me. Anyway, by the time I put my third sticker on Ashrind I could tell where things were headed, and I wanted to rep my beloved and favorite general-purpose proglang. “Praise Love”: This candy-colored and vaguely chthonic goaty friend comes from the hand of Gloombones, an artist whose ouvre of gooey happy-necromancy cartoons I discovered early last year. Embodies no meaning to me other than its own self-evident grinfulness. Last week at a coffee shop a little girl ran right up to this sticker, practically planting her face on it, agog and delighted. Unsure how to react to this I kinda just waved hello, and then her mom ushered her away and out the door wordlessly. Empire Tea & Coffee: My standby coffee shop in Newport, Rhode Island, the sleepy seaside city I lived in for over three years, and where I continue to rent an office. Nothing much to add here! Interactive Fiction Technology Foundation: Recalling my positive feelings at Duck Duck Go showering me in vinyl stickers, I supported my nonprofit buying a sticker-stack with our own logo, and naturally I affixed mine the moment we received them. We’ve sent a few others around, but not in any habitual fashion, let alone an organized one. We really gotta remember that we have these! People love stickers, I hear. CRU Cafe: During a recent visit to this classy corner establishment in Newport, a barista approached my table and handed me this sticker while complimenting the others. I am an easy sell.